What, who, where, and when is TReK’d? TRek’d is a Star Trek parody fan film project in production since December 2015. A trailer was released in 2016, and now after a little over one year on hiatus, the production is moving out of dry dock, and is now finally at full impulse power. Helming the project is writer, director, producer, and artist Da Han. An avid Star Trek enthusiast from Hollywood, CA., Da Han directed one of the earliest Star Trek fan films produced, helping pave the way for a new generations of sci fi fan filmmakers to embark on similar creative journeys inspired in the same way he was to pursue filmmaking as a career. 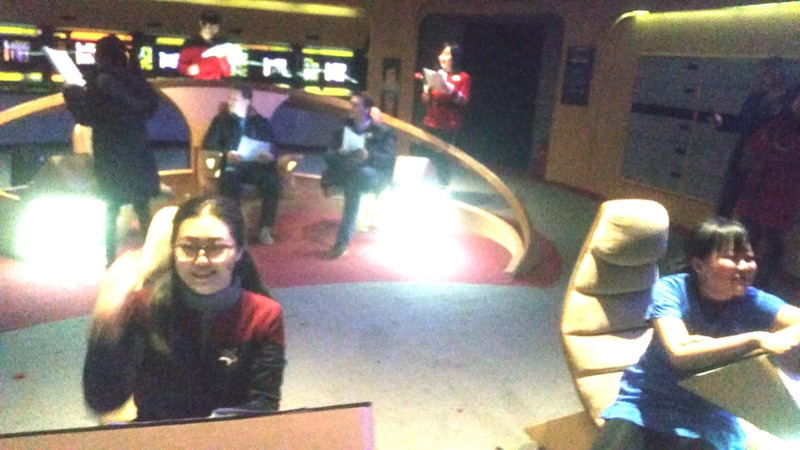 Fast forward to present day China, and Da Han is introducing Trek oriented filmmaking to China in a way that fans here can not only understand Trek as a viewer, but experience the filmmaking and creative process of making a Trek related film of their own. Our cinematographer Amitesh, hails from Mumbai, India and is a presently a designer with Mercedes Benz here in Beijing. Our Sound engineer and all around production coordinator / co-producer CrazyEMH, is a regular Scotty. Newly graduated, Sid’s job is hardware engineer. We’re not sure yet if he’ll act in the show but we’re hoping to see Sid on screen somewhere…or at least on audio. 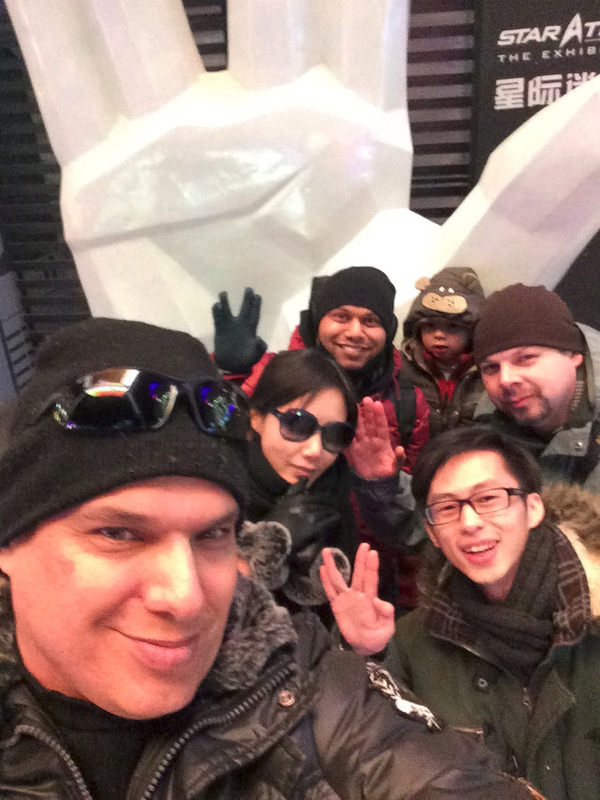 Martin Bähr, a software engineer from Germany, now residing in Beijing, is a major Trek aficionado and contributor as well as a co-producer, and actor on TReK’d. Martin portrays the character of Lt. Horatio. Since childhood Horatio has dreamed of taking the center seat as a Star Captain, yet the fate of his reality has placed him in a seat in front of a desk, and as nothing more than a mediocre museum ship curator. Fortunately (or unfortunately), this museum happens to be the retired Enterprise. Knowing its not an operational ship, Horatio’s sense of pride is false at best in front of his son. It was a usual mediocre day and Horatio leaves for the museum on a routine inspection. It was a few days before the anniversary of the battle of Wolf 359. The ceremony was to be held on board the now repurposed ship/museum. High-level officers and new students who have just entered Star fleet Academy, will be gathered there for the opening ceremony. Horatio as a curator, is anxious yet confident that everything will go according to plan. And why not…its just a party. Horatio is a family guy, stubborn, old school, never uses Transporters, and instead uses the outdated and somewhat slow space elevator to work on the ship, even though the elevator is much slower. Horatio is at best a Walter Mitty nostalgic arm chair historian. Completing part of the days work, he takes a break to drink earl grey tea, but when the cup makes an abnormal sound, and the ship begins to shake. Horatio is at a loss. And unlike his dream as a captain wth an adventurous career, Horatio is a curator, and becuase he has become so accustomed to a mundane routine career, when things go awry he is as confused as the rest of the crew. We’re very grateful to the actors involved in the early portion of shooting over a year ago, including Jade, Shook, etc., etc., As a result we have usable ship footage, but we need more footage to round out our story. That’s how you can help. Yes, now you can become part of our production by using any old webcam or cellphone to make a selfie video. We have relative story material, but in order to make the content more substantial, we urge everyone to join our production by recording videos of YOU for us. NO acting required. In fact we want you to just be YOU. Many of you have seen captain’s logs, and the first officer’s log etc., but Star Trek rarely portrays a normal crew members’ daily work, we intend to insert this into the main storyline. Usually the communication between crew are mostly audio-based (off screen), but we wondered why not video calls? Its the future…imagine the feeling of being lost in space far far away from home, walking in a starship corridor with a selfie stick …what would you say and think. Would you laugh, would you cry, be silly, sing, rap, attempt to solve technical ship related issues, or just complain? Who would you call? Record video in the form of a crew log or video call. Just face the phone / computer camera, speak and record. Pure white / green (green curtain) wall, so that we can be process it later as if you are in the corridor, crew quarters and so on. Of course, if you can not find a white or green wall, then any solid background will also work. Light or dark background if you need to shoot from your school dorm room. We welcome you to play with your own imagination, think of all the places you could be on a starship, Make sure you don’t have things seen in frame that reflect today’s era (unless you establish yourself as a 21st century vintage retro lover). Anything you can do to make it easier for us to use and process easier will probably ensure you get more screen time. Ordinary tourists, with no knowledge of actual Star fleet protocol. Use your imagination…in the Star Trek Universe anything is possible and any kind of cosplay character is ok. Or just be YOU. There are many of you who hope to work on a star ship but your Star Fleet grade is so low that you can only compromise by taking a job cleaning Enterprise’s decks or by working as a tour guide etc….but you’re still excited to be there. Many of you know Star Ship and Star fleet history and technology intrinsically, but only from a text book perspective. Clothes / uniforms or makeup should ideally match your selected role, race, type of work and so on…but you can be more creative if it makes sense and is well…funny. Start of the work day. You are just starting work. Maybe you missed breakfast and are thinking about trivial issues, promotions, and classmate rumors. The commanding officer and curator, Horatio arrives. Things become serious. No more goofing around. The ship leaves dry dock, and is out of control. You feel fear / madness / any emotion…or maybe no emotion if you’re part Vulcan LOL. The ship is controlled by unknown forces and is moving somewhere. You feel uncertainty, fear, doubt that the captain (Horatio) does not know what to do. Beam down to planet. After a red shirt investigation, a box is discovered (at this time you do not know what it is). You will probably only know that it’s a box left behind by a crazy scientist who uses this box to control minds, is smaller than Landru and more hyper A.I. We won’t show you the box yet but you can guess what it looks like. Only a few of the commanders know. You’re hearing mostly here say and rumors. Below are further expanded examples of some of the settings and tonalities mentioned above that may help you form the basis of your character, and mood. Use colloquial language. Or even sign language. Or just cry and laugh. Language can be optional, If you speak it can be in Mandarin or English or any other known or unknown language or dialect. Choose your setting, and character, press record, and go. You can record something for all 6 order of events in the story if you like. Below are a few examples to get you warmed up. Make up your own dialog though. These are examples only. You can add any details you want. Call any body. Call your friend who can also record a chat so both of you can contribute. If you record a number of sets in a row, you can also let the details develop. Open your imagination, Improvise, be funny, silly, or serious. Ordinary tourists, alien, looking out the window outside into space, leaning against the wall: Where’s the vomit bag on this junker?! Record and send. You don’t need to edit. We will deal with it. Just record, and have fun. Post an weibo with the video and @ us. @迷于星际迷航播客. Deadline is June, 1st, 2017, Beijing standard time(UTC+0800). If you’ve joined the TReK’d Fandom Central Wechat group, you can ask us further questions. We’re a zero cost production. Accordingly, we are not able to pay for contributions/submissions. Video clips will be used in the first episode of TReK’d, but you may later appear in later episodes if we like your character enough. By submitting videos to us you grant us full rights and reuse therein including but not limited to marketing purposes in perpetuity. Thank you and happy shooting.